The letters of John Lennon are scheduled to be published in October 2012. The announcement was made on Friday, April 9 by the publisher Little, Brown and Company. 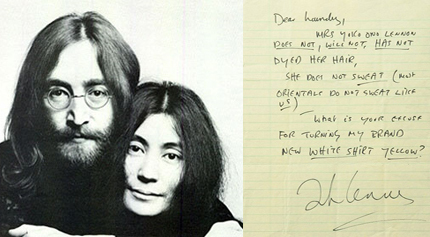 “The Lennon Letters” have been collected in collaboration with Yoko Ono, Lennon’s widow. This marks the first time she has helped compile and given permission for a selection of her late husband’s letters. The book will be authored and edited by Hunter Davies, the official Beatles biographer who has also worked on Ono’s own archives and hunted down the correspondence from John Lennon that is now available to the collectors, dealers and the original intended recipients. Letters by John Lennon that have been put for auction in recent years tend to do extremely well. Even people who got bawled out in a letter by Lennon – like an art critic at the Syracuse Post-Standard – opted to save what he had written. The letter to the art critic, handwritten by Lennon in 1971, was bought in 2003 for more than a whooping $38,000. While the price for “The Lennon Letters” has not yet been officially declared, it is expected to be considerably less.